Foundation piecing is so much fun! I love that you can make a picture from fabric with only straight line seams. It’s like putting together a jigsaw puzzle. I’m almost finished with Carol Doak’s Scrap Scramble block-of-the-month project that she’s been running on her Yahoo! Group here since last fall. You’d think that it would by easy to keep up with one block per month, but I managed to get 4 months behind! Now I’m caught up and and I’ve sewn all up the whole thing. It still needs a border, batting, quilting, and binding, but it’s at a good pausing point. Thanks to my hubby for helping me with the photograph! 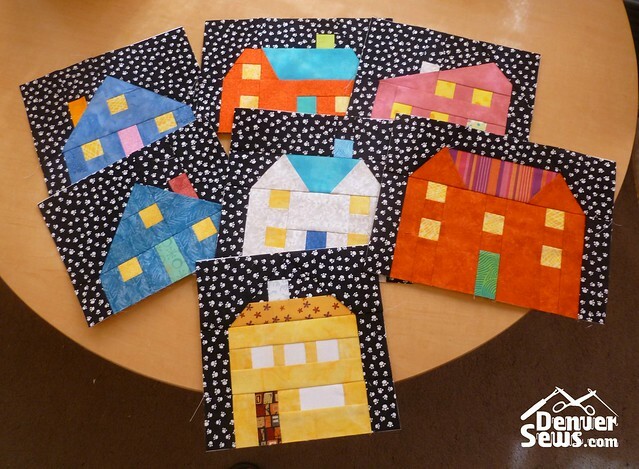 Carol Doak is having a sale on her website and I picked up the foundation pieces for two miniature quilts. So now that’s on my list of things I want to do. There’s just never enough time for all of my projects! What’s so great about quilting? There seems to be a divide between quilters and garment sewers and I don’t really understand why. Here are some of the reasons I like doing both. I like fabric. If I see a nice piece of fabric, I want to do something with it. Either turn it into something to wear or use it in a bag or quilt. I also like seeking out coordinating fabrics. Any excuse to acquire more fabric is good for me. I like making useful things. Clothes are useful. Bags are useful. And quilts are useful. Even small piecework can be turned into nice pot holders, tote bags, place mats, pincushions, pillows, or other gifts. I like technical challenges. Garment fitting and construction are sometimes quite difficult for me and I have a long way to go to get better at it. Piecework and quilting are also technically demanding requiring attention to detail and learned skill. I love tools. Both hobbies benefit from specialized tools that are fun to discover and use. Why limit your tool collecting to just one hobby? So really I think if you’re on one side of the fence or the other, there may be something to offer on the other side that feeds the same pleasures that you get on your side of the fence. Just think of the fabric stash you get to build if you both quilt and sew garments! Hmm. While there is some overlap in terms and technique, it seems to me garment sewing has a much wider field of knowledge to aquire and opportunity for challenge than quilting. I started my sewing life with quilting but haven’t really quilted for some years. I feel that there was a small amout of challenging techniques and once those were in hand the only place left to go was to replace new technique with time consuming details. Maybe if I was interested in the new trend of surface design I’d still be quilting. Lynne – this is amazing work. Great job! I love those little mini quilts. I just pieced a pincushion and that was quite the adventure. I also made a quilt block (well, Kitty and Pam did all the heavy lifting after I made a mess of it.) But quilting is hard and not just zipping straight lines together. It’s like I’m using a completely different part of my brain. Very different from garment sewing. I think the skills and tools are definitely interchangeable. I’m not talented enough to quilt, and certainly not patient enough. In my limited brain, you cut beautiful fabric into tiny pieces and then sew it back together…and you can’t always wear it when you’re done…but the amazing work that a loving quilter accomplishes is just stunning. 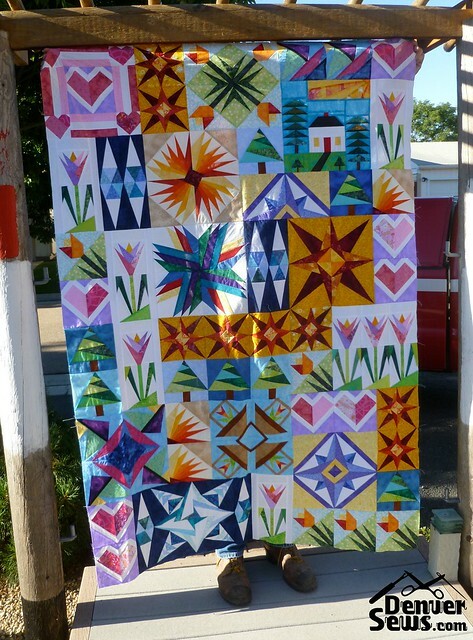 Oh my goodness Lynne, your scrap scramble quilt top is absolutely stunning! Will you do the quilting yourself? I’m with you on wondering why there’s such a great divide between quilters and garment sewers. I enjoy both. I think the skills learned in piecework are applicable for garment sewing and vise versa.